Start Here: Python Programming for Beginners is a book for the total beginner who is interested in programming. It teaches the new programmer from ground zero through hands-on exercises. 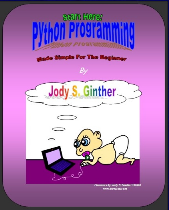 Start Here: Python Programming for Beginners was written to be as simple and brief as possible to avoid unnecessary information that may confuse a beginner. It is humorous and was written to reflect the changes in Python version 3 and later. Jody S. Ginther is a professor who has been teaching Business, Math, Science, and IT subjects at universities in mainland China for the last 12 years. He was born in Sidney, Montana, USA. His hobbies include; working, martial arts, other arts, animation, and music.